The molded sweet is a long-standing tradition at the Lebanese table, a true and beloved trademark. Sometimes that sweet is a cookie (ma’moul), sometimes a sweet bread (kaik, KAH-ick). They are beautiful, these little works of art, their imprints like an engraved invitation to a very special party you won’t want to miss. Mine are not kaik molds that have been handed down for generations in the family. In fact, my use of molds for the sweet breads would be considered sort of fancy, sort of over-the-top, sort of…unnecessary…by our women. The same way they watch me cut out my circles for fatayar and wonder what’s gotten into me to try to make everything so perfectly perfect (that method is not standard practice, not Sitti practice, in my clan but it’s a practice that works well, so I embrace it). Even though our sweet breads turn out beautifully without the molded imprint (a fork and your fingers make fine designs), I was curious to see how they worked. The molds can be ordered here—Dayna’s Market of Dearborn was introduced to me by a reader (thank you Sam!) and is a tremendous resource for Lebanese pantry items—and they are very inexpensive, so I figured that even if they didn’t deliver on their promise to beautify our bread, there wouldn’t be too much lost in the trying. Another great online source for the molds is here. Get the large-sized kaik mold, which is about 6 inches across and works for small or large breads. It’s no surprise to me that I love the kaik molds, love their neat, clean design and the way they worked so beautifully with the dough. These are molds I’ll keep a while, molds worth using, saving, and handing down. 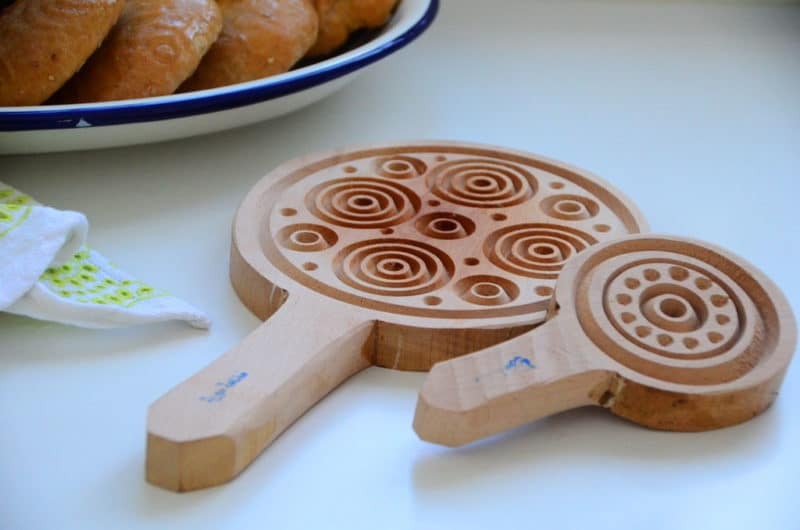 16 Responses to "Favorite things: Wooden Molds for Lebanese Sweet Bread (Kaik)"
My daughter and my sister both sent me some Kaik…..now I don’t have to make my own. I am enjoying the fruits of their labor….isn’t it interesting that all our Lebanese “treats” are based around holidays or religious occasions? My mom used to rubber band together feather quills , usually 5 in a bunch and us kids would stamp out our designs in each cookie after she rolled them and pinched the edges. Those were the days. I have discovered your beautiful blog! I am Lebanese-American. My mother born in Beirut, AUB educated, and my father’s parents were immigrants from Deir me Mas and the North mountains. He was born in Brooklyn. My parents now live in South Bend, IN. I see you are not far in Harbor Springs. I am in Lancaster, PA where there is somewhat a dearth of true Lebanese food. I am still learning to do different dishes on my own. There are no words to describe the relationship between family and food in our culture and I love reading your stories and recipes–you have a wonderful resource here. Very comforting to me as I am often homesick. How special, Evelyn, thank you. My father’s family is also from Dier Mimas, so we have much in common! Maureen, I hope you are going to post a recipe for Kaak.It would be fun to compare notes. I have a beautiful mold that my mother handed down to me. The design is very intricate and looks lovely when pressed into the kaak dough. I absolutely love these desserts and have fond memories of my mother’s huge roasting pan full of kaak . I always fished out the ones at the bottom because they were always full of the sauce(juice) or cream. I make them at Easter but not every year because as you know, they are so fattening! Thanks for bringing back these lovely memories. I was so excited to see you mention kaik. I couldn’t find it listed with your recipes. Do you have a recipe for this yummy sweet bread my sittie gave us with tea when we were kids? Thank you for your posts… I love them!! Recipe is coming this week! Evelyn, what a lovely post. My father, too, grew up in Brooklyn, and you so beautifully express what we all feel about our culture, and the relationship between our food and our expression for love of family, friends, and life. Maureen, my Mother never had one of these molds, I didn’t even know of them, but they are beautiful–my Mother too, used her fingers and a fork! You are beautiful in every way. TY. Thank you thank you, dear Diane. And interesting to note it isn’t just my clan that didn’t use the molds. They’re so pretty (and make quick work of it), I’m not sure why! Thanks to my generous cousin, Georgette, I received a fresh supply of mahleb on Saturday! My ka’ak recipe was handed down from my grandmother to my mother to me. We’ve never used a mold, but instead form small ‘donuts’ and then make a design with the potato masher. I just finished making 12 dozen and will be sharing them with friends and family alike. And when warmed, the oven still holds the glorious aroma of the spices, so the magic of mahleb remain long after the sweet treats are gone! Hi Maureen, we placed an order for one of the molds from Dayna’s in Dearborn. Just to let you know, they are charging us $7.99 for the mold but the total including shipping is $36.98, a little excessive, don’t you think. Is this coming from Lebanon. Greg, thank you. Dayna’s uses FedEx along with their handling fee, and it’s better to place a larger order with them to make it worth your while. I haven’t found good molds anywhere else online, but if you do, please let us know! 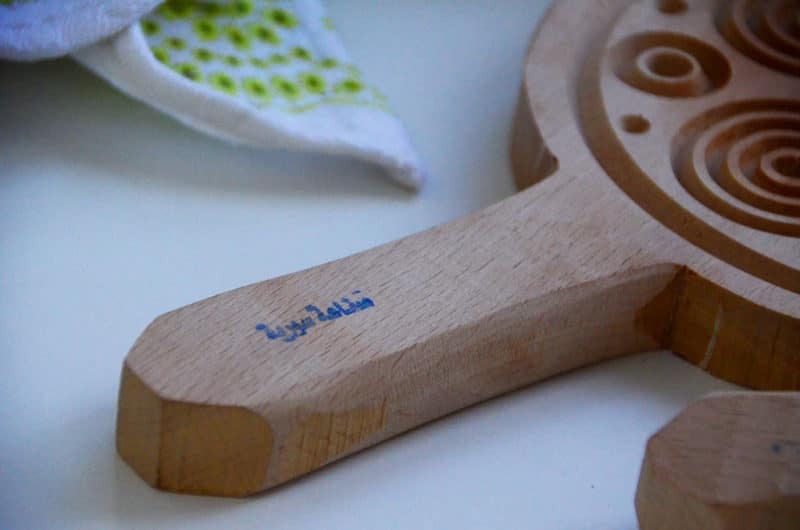 Am searching for mamoul wooden molds , but not the ordinary design and shapes, where could i find it. Hello Ayesha–thanks for letting me know about the link! I’ve updated it, but also, click here.